Unfortunately our webshop has been down due to some technical issues. As I was out for a few days, I noticed it to late. Anyway, we’re back again, and our goodies are ready for you! All fit in the BlueBox01, and use the BlueBox01 included lightguides! 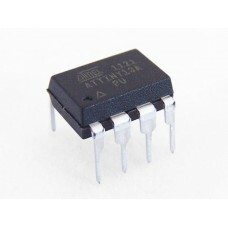 Little-RED, also known as MicroProg 1.1 is another unit in the BlueStack-Micro-range. 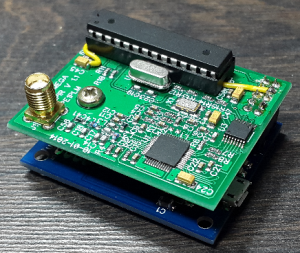 This unit is the program-adaptor that fits to your pi-radio, and gives you the opportunity to do firmware-update’s, but also MMDVM! If you connect the USB-port to your PC, it will find a comport. In the first 60 seconds this units is connected it is a programming-adaptor (same like Micro+), after the 60 seconds, the programming-options are disabled, and the unit is now capable of interfacing your pi-radio to MMDVM-host, or G4KLX. No, this module is basically a PC-interface for PC or Raspberry-pi. 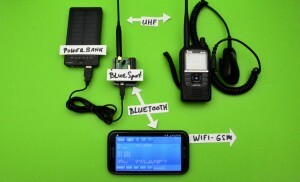 For Bluetooth communications, choose either BlueStack-Micro or BlueStack-Micro+. Lately I discovered that the board did reset during operation of MMDVM-host. It seems the same line that resets the radio-board for uploading new firmware is toggled sometimes. Several solutions to solve this are available, and one of them I removing the wire after firmware-update. In some cases it could be handy to put a small switch inline with this wire, but still, it is some extra thing to do when a new update of firmware comes out. is used as MMDVM-interface, Bluetooth has no issues with this! The new boards that are sent will have a timer inside, which allows the board to run as firmware-updater for approximately 1 minute. After the time expires, the reset to the radio-board will be disabled. BlueStack, Blue-Spot, what is this about? 2: Pair the unit with your phone. It shows up as BlueStack, pin 1234. 4: Start the App BlueSpotDV, and verify the settings. BlueStack-Micro and BlueStack-Micro+ Available now! Finally the first boards are in production. BlueStack-Micro is its name. David, PA7LIM is writing new software, an app to support multiple platforms on android OS. 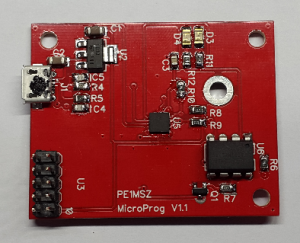 To have compatible hardware, this little board will be the first to be released in a series of 3. 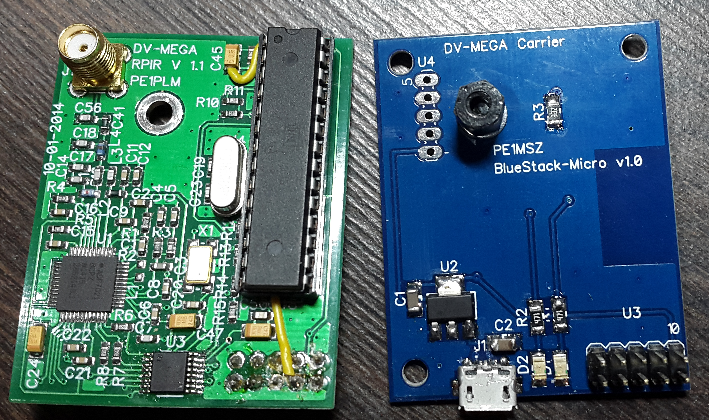 BlueStack Micro, a board that fits the PI-radio (dvmega.auria.nl), bringing a Bluetooth connection to use your phone to connect to the global network on D-star DMR and later Fusion! 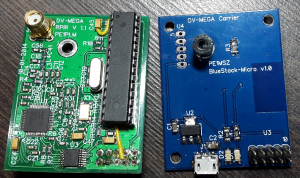 BlueStack1, a board you can ‘stack’ between your arduino and the dual-band-radio (dvmega.auria.nl), and use it via Bluetooth to your phone / tab. 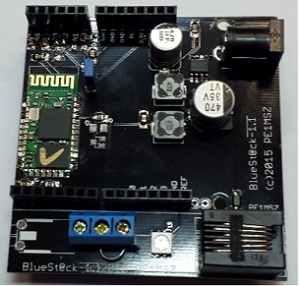 BlueStack2, a board that has similar features as above, but also has an integrated amplifier and dtmf-unit. Just put the AMBE3000 in place, and use it as a HAM-radio! What is the difference between BlueStack-Micro and BlueStack-Micro+? BlueStack-Micro is a board, which is ONLY Bluetooth capable, and can be used for the BlueSpotDV-App, connecting to both dual- and single- band raspberry-pi radio-module. 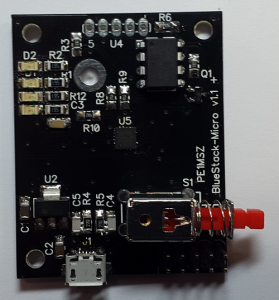 BlueStack-Micro+ is equal to BlueStack-Micro, however has an onboard USB-UART, usable for upgrading firmware, MMDVM, and G4KLX software. new processor code now disables programming-mode after 60 seconds, to fix MMDVM-coms via USB. If you do see issues, remove the wire after radio-firmware upgrade. Order your BlueStack-Micro or BlueStack-Micro+ here! User and installation-manual for BlueStack-Micro Here! User and installation-manual for BlueStack-Micro+ Here! As we are releasing BlueSpotDV soon, the boards to make the magic happen is available now. Just like it’s small brother (blueStack-Micro and BlueStack-micro+), it makes your cellphone the mobile hotspot you have been waitinh for!! Just take the UNO or Megaboard, and place this board on top. Then just place the dual-bandradio (dvmega.auria.nl) on top. Once you loaded the latest firmware for this BlueSpotDV, you will be able to pair your smartphone with it, and do nice QSO’s on DMR and D-Star. DC-jack, which powers all boards, use this to make sure you have low-loss/low-heat regulation. RJ11 external battery-connection. BluePack will come soon as well, high capacity battery-pack to feed all units! Building the next generation : BlueStacK! Last couple of weeks all elektronic circuits have been tested, and proven to be ok. Now the time has come to finetune the diagrams, and design the circuitboards. Well just follow the blogs here, and you’ll be amazed what stuff will come out, and I do not mean my stuff only! 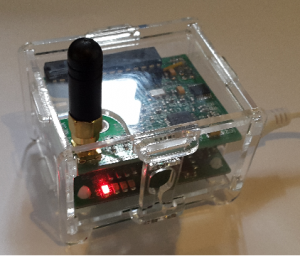 Project1: Bluetooth connectivity to cell-phone with a nice new app of PA7LIM. The board designed for this has a few nice extra’s. 1: Bluetooth module integrated, 2: Low-heat voltage-regulator so we don’t have hot boards anymore. 3: stack your repeater-board, or GMSK on top, the board fits in between Arduino and other hardware designed by Guus, PE1PLM. 4: Connection to a battery-pack with integrated charger. 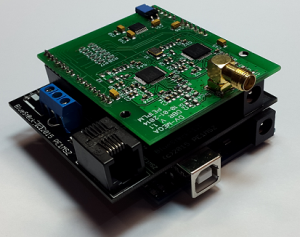 Add massive power to your repeater or AMBE. Project2: Same as project 1, but has extra’s like a full control-unit for audio, led’s as indicators, and option to use a yeasu or Icom microphone. Send DTMF to control your connection, which you also can with the dtmf-project. Join our website for updates, so we all keep you posted!